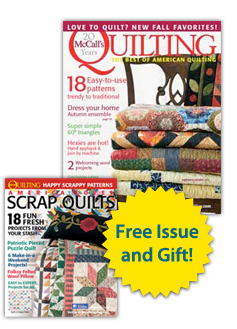 McCall's Quilting - Free Preview Issue! YES! Please send my FREE Preview Issue of McCall's Quilting right away! If I love it and choose to subscribe, I'll get five more great issues (6 in all) for just $16.98 + $3 p&h — a savings of 44% off the newsstand price! If not, I'll write "cancel" on the bill, return it and owe nothing. The FREE issue is mine to keep no matter what! INSTANT GIFT: I'll also receive a FREE bonus issue instantly! 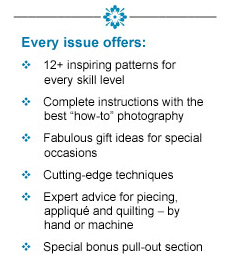 A $5.99 value, America Loves Scrap Quilts contains 18 fresh, fun projects for using your stash. I understand that I will receive uninterrupted service and delivery of my magazine and that my subscription will be automatically renewed each year at the rate then in effect. I won't be bothered with any renewal notices in the mail; instead, I will receive a clearly marked annual reminder about 60 days before my credit card is charged or a bill is sent. I may cancel at any time during my subscription and receive a refund on any unmailed issues by calling 800-944-0736 (U.S.), 1-386-597-4387 (Int'l), or visiting Subscriber Services. If giving a gift, this does not apply to your subscription or your gift subscription. *Savings based on an annual newsstand price of $35.94. McCall's Quilting is published 6 times a year. Rate valid in the U.S. only. ©2019 F+W. All rights reserved.